Brazil enjoys an abundance of biodiversity from the Amazon rainforest to the microbes in its soil. 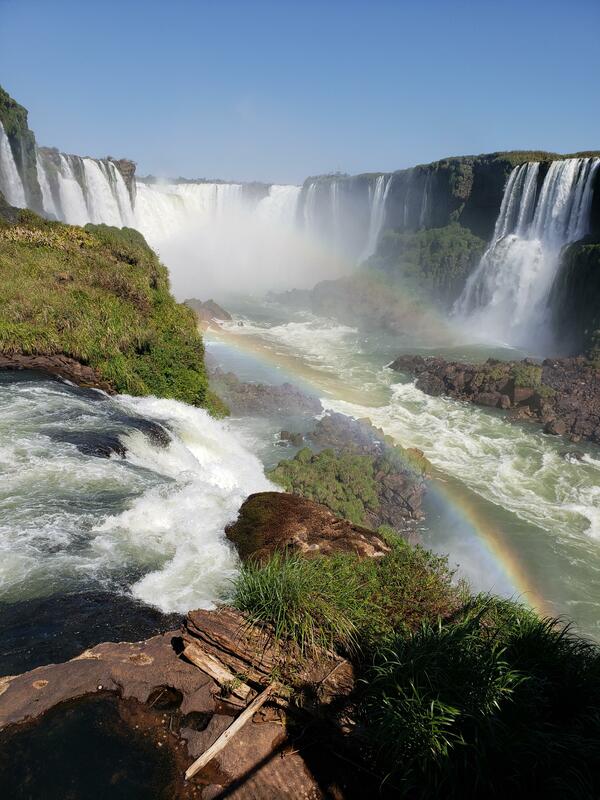 Most travel to Foz do Iguaçu to see one of Brazil’s most famous attractions, the stunning Iguassu Falls. This August my colleague Rosemary Clark and I journeyed to the State of Paraná with our sights set on a different natural wonder: microbes. At the 16th Symposium on Biological Nitrogen Fixation with Non-Legumes (BFL-NL) we met with researchers from a host of specialities, including evolution, biochemistry, genomics, and crop production, to discuss the newest research in microbial inoculants. The work of our fellow scientists rangedwidely. Some of the most exciting developments we saw pitted microbes against one another to identify the fittest on roots of corn, discovered transferable genes that improved nitrogen-fixing capabilities in less-efficient rhizobia strains, and with an eye on biosafety, teased apart potentially harmful bacterial species from beneficial plant-associated species. Do different genotypes of maize grow best with specific strains of plant growth promoting rhizobacteria (PGPR)? To find out, Eduardo Balsanelli of the Universidade Federal do Paraná, Curitiba designed a remarkable experiment involving two maize genotypes: 2B512, which was responsive to the nitrogen-fixing bacterium A. brasilsense, and 30A37, which was not responsive. He planted each cultivar in field soil and, at different growth stages, studied the microbes in the rhizosphere. At a high level, the microbiomes of the two maize varieties appeared to be made up of the same general types of bacteria, but upon closer inspection, Balsanelli discovered distinctions in specific species, suggesting a sophisticated relationship between each maize variety and its microbiome. To better understand the PGPR preferences of the maize cultivars, Balsanelli supplemented the maize with a mix of PGPR isolates. The isolates then competed to colonize the root structures of the maize. After measuring the abundance of each PGPR isolate, Balsanelli moved the top colonizers on to the next round. In all, he completed six cycles of selection and at the end of the sixth cycle, he tested the champion PGPR strains with each maize varietal. Impressively, he was able to select down to the a few highly-competitive colonizing PGPRs for each cultivar. In a number of instances, as there were as many as a billion colony forming units per gram. The champion PGPR isolates accounted for more than 10% of the total microbial community on the root, allowing them to provide impressive effects on plant growth . Balsanelli’s research, and the advances that proceed from it, will enable researchers in the field to customize inoculants to specific varieties of crops, delivering tailored, efficient, and cost-effective resources to growers. As we know from Balsanelli and other researchers, not all rhizobia are created equal, and some nitrogen fixing bacteria strains are better than others. That recipe is part of Pivot Bio's success - we use the best available microbes to provide nitrogen to corn. It's also why we were so interested in the work of Graham O’Hara of Murdoch University. In O’Hara’s native Australia, 98% of crop legumes and 75% of pasture legumes are supplemented with a Rhizobium, and are sometimes co-supplemented with Bacillus. In a country with nearly 80 million acres under cultivation, that’s a lot of microbes working together to support agricultural production. During his presentation on mobile genetic elements of PGPRs, O’Hara explained that “strong nitrogen fixers” have to compete with less-efficient, “weak nitrogen fixers” in the soil, leading to less overall N fixation for the crop. In his research of the strong fixer Mesorhizobium ciseri WSM1271, O’Hara discovered that some parts of the genome were actually mobile and that the “strong nitrogen fixer” traits could be transferred to the less efficient, but native to Australia, M. ciseri, making them better at providing nitrogen to crops. O’Hara strongly advocated for using in situ field verification of successful microbe colonization of crop roots, a step we take seriously at Pivot, and one that sets us apart from most other ag companies working in the microbiome space. With the help of our grower-partners, all of our inoculants are rigorously field-tested for both colonization and nitrogen fixation capabilities during the development process. At Pivot, product safety is of paramount importance. No one wants to use a microbe in agricultural production that might cause disease, and Dr. Hirsch and her team are doing the research to separate the good bacteria from the bad. They conducted a genome-wide comparison of Burkholderia species, identifying the pathogenic and non-pathogenic strains at the level of their DNA. They found that the plant-associated species of Burkholderia formed a distinct group, which lacks the genes linked with human pathogenicity in Burkholderia cepacia, and have published peer-reviewed articles to reclassify them as a new genus, named Paraburkholderia. This is an important advance which will allow valuable, non-pathogenic PGPR strains to be developed as inoculants, while keeping high-risk strains out of the environment. Rosemary and I, along with the entire team at Pivot Bio, are immensely grateful to the hosts of the BFL-NL Symposium for facilitating this opportunity to collaborate, create, and question. Many thanks to our fellow researchers for their ingenuity, their care for our global environment, and their support of the farmers who feed us. We hope to see you there next year!